Elder & Cannon Architects have drafter plans for a 12 storey student tower constituting 308 bed spaces at New City Road, Glasgow, on behalf of Bankell Developments. 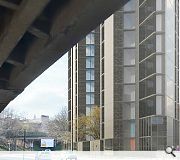 Situated over the road from Glasgow School of Art’s soon to be delivered School of Fine Art the brick build will punctuate a key sightline along the Great Western Road corridor as it is bisected by an elevated section of the M8 motorway through Cowcaddens. 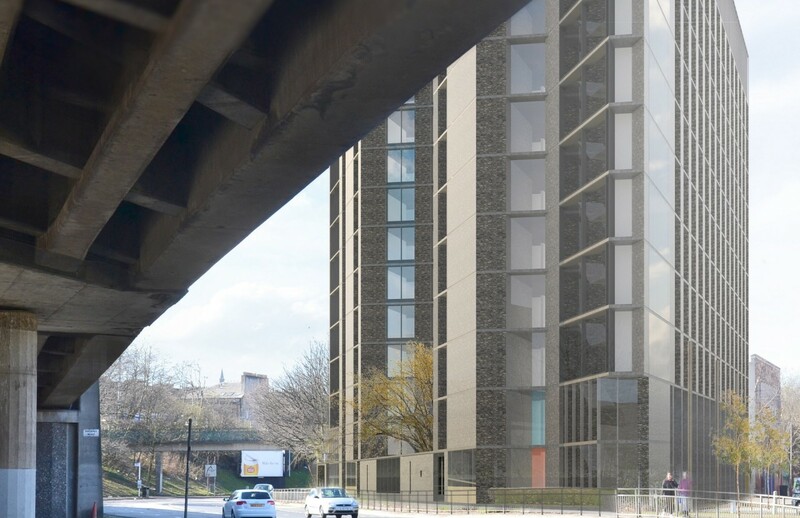 Adopting a triangular floorplate the scheme will incorporate a security controlled lane and courtyard between Phoenix Road and New City Road which doubles as a principal entrance space with ground floor devoted to amenity and social spaces. 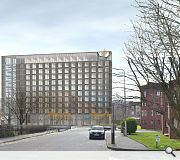 In an effort to tame the hostile local environment the building will be afforded a sense of scale in a bid to anchor it within a fragmented landscape of scrappy green space, disjointed housing and chaotic road network, with a top floor roof terrace also on offer to students. This is exactly the sort of scale we need to re-establish New City Road as the continuation of Great Western Road into the city centre. The fragmentation of this area is one of the most toxic legacies of the M8. 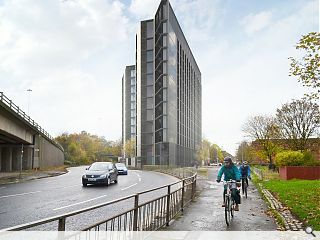 Gehl's 'Underline' concept for rehabilitating New City Road and the new GSofA campus at the former Stow College building will also help to address this. More fundamentally we need to recreate a solid urban grid and street edges in that entire area bounded by St George's Road, New City Road, Garscube Road, extending right up Garscube Road to Queens Cross and up Keppochhill Road to Sighthill. That district - Cowlairs, Possil, Port Dundas, Woodside - is one of the most depopulated, oppressive and fragmented urban environments in the city and revitalising and stitching it back into the city centre grid at Cowcaddens and Garnethill would transform the fortunes of the north of Glasgow radically. Absolutely agree with the second comment, this must be the best proposal for the charing cross corridor to emerge in recent years (second only to covering the M8 with a linear park). High quality detailing, decent materiality palette and scale executed beautifully. If only the hideous Scottish Power HQ had followed a similar design. 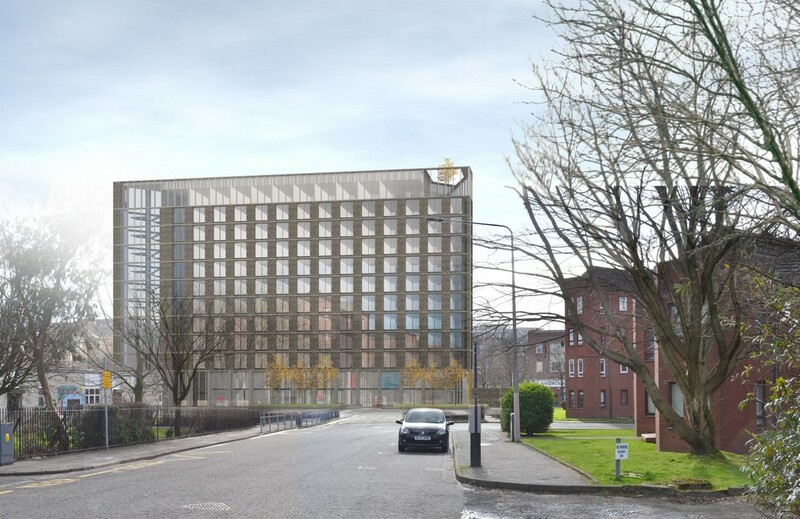 Let's hope this building acts as a precedent for the entire area around Cowcaddens/New City Road/Garscube Road, it is an embarrassing wasteland so close to central Glasgow. Agree with Paul. This is hopefully the beginning of the regeneration of an area of the city that should be a thriving link to the GWR into the city centre. Yes it kind of sticks out at the moment but with more developments in the area which compliment this building it should be great going forward. Is that really a tree proposed at the top floor? I was wondering about the tree as well - surely it is not a long term feature.